The Carolina Panthers released the disappointing David Carr on Wednesday and picked up Muhsin Muhammad, who was released from the Chicago Bears last week. He rejoins the time after spending nine seasons with the Panthers after they drafted him in 1996. He spent three seasons with the Bears after a monster season in Carolina in 2004. The Panthers released him because of a salary-cap move and have never been able to get another receiver to complement Steve Smith at wide receiver. Both receivers were Jake Delhomme’s top two targets in the 2003 season when the Panthers had their only trip to the Superbowl. They lost 29 – 32 to the New England Patriots, but Moose recorded the longest play from scrimmage in a Superbowl with an 85-yard TD reception in that game. I wish Moose all the luck in the world and I’m sure he’s happy that he’ll have a chance to finish up his career with the team he started with, but the guy is getting old. He had a chance to be the Bear’s #1 receiving threat and brought a lot of wisdom and leadership to the receiving corps. However, he dropped too many passes and Bernard Berrian was much more of a #1 than Moose was. I wish he would have been able to recreate his 2004 season with us just once, but, dare I ask, is Jake Delhomme a better quarterback than Rex Grossman or Kyle Orton? 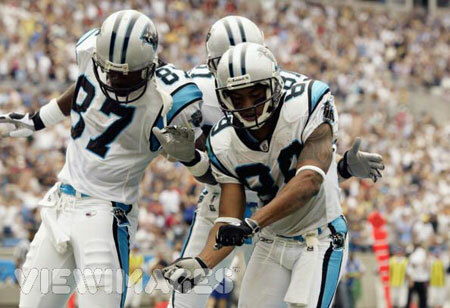 If you think back to their 2003 and 2004 seasons, they had a monster passing tandem in Steve Smith and Muhammad. They also had a solid running game and defense. I’m sure that Steve Smith is happy to have another passing threat in the line-up so that some pressure is taken off him upfield. Then Keary Colbert, Drew Carter and Dwayne Jarrett can fight for the #3 spot. It’ll be interesting to see how they do next year, depending on how well Delhomme comes back after surgery. I think the Bears need to take note here. Solid running game. Defense who establishes themselves. Decent quarterback throwing to a deep threat and a reliable slot/route/#2 receiver. O Line protecting the QB and making holes for the running backs. Hmmm….the Panthers may have had something there. Throw in the fact that we should have a better RB in Cedric Benson than anyone the Panthers have. And with Greg Olson and Desmond Clark at TE, we should have a reliable option in the short-passing game. If Berrian comes back and Hester develops, we know that both of them have the ability to get open down field. Mix that with a healthy defense and we should fair better in 2008. I know what you’re saying. Wishful thinking, huh? Yeah, it turns out it wasn’t Rex after all. Who would have thunk it? (Oh, yeah, me). But I wasn’t the only one that saw past Rex’s horrible passes and into deeper reasons for the Bears offensive ineptitude. The receivers drop passes and outside of Bernard Berrian, don’t get open frequently. The offensive line seems half as effective as they were in 2006, both in the passing game and in the running game. But the real issue is Cedric Benson. The guy is not an every down, load-bearing back. Sure, like I said earlier, the offensive line isn’t opening the same holes. But it can’t be doing that much worse than in 2006. And I’m not buying into the idea that many meathead Bears fans believe, that with Thomas Jones the offense would be cruising along. Check Jones’ stats with the Jets. He’s not exactly tearing it up. But if a guy is going to be a focal point of an offense, a 300-carry, 1200-yard plus running back, shouldn’t he be the a top ten or top fifteen back? I think so. And yet, if the Bears had their choice, I bet there are a ton of running backs in the league they would start ahead of Benson for the remainder of this season. In fact, lets go with that premise: How many active running backs would I, hardawayhatesyou, rather have as the Bears’ premier back for the remaining twelve games on the schedule? Dallas: 2; Marion Barber is a definite and Julius Jones is a strong back who has proven he can be a number one back. Philadelphia: 1; Brian Westbrook is an absolute yes–sure he might break down on his first carry, but if he’s healthy he is a beast. NY Giants: None; You could make an argument for both Brandon Jacobs and Derrick Ward, but neither have proven to me that they can be an every-down NFL back. Washington: 2; While Clinton Portis has not shown the same burst in DC as he did in Denver, he’s definitely better than Benson. Ladell Betts went over 1000 yards last year and is a strong runner. Minnesota: 2; Adrian Peterson and Chester Taylor are both better than Benson. Detroit: None; Like the Giants, Detroit has two backs–Tatum Bell and Kevin Jones–who one could argue are better than Benson, but I’m not ready to go there. Jones would be a definite yes if I thought he could last more than six games. Green Bay: None; Maybe in a year or two Brandon Jackson will be a stud, but I’d take my chances with Benson at this moment. I’ll take their quarterback, though. Seattle: 1; Shaun Alexander is a definite yes. San Francisco: 1; Frank Gore, despite his recent struggles, is clearly a better option. St. Louis: 1; Steven Jackson, see the Gore comments. Arizona: 2; Here is where I might lose some people. Edgerrin James is easily better, but I’m also gonna throw Marcel Shipp as a better option than Benson. Shipp had over 800 yards on 188 and 224 carries, respectively, in 2002 and 2003. He also had 103 receptions in his first three seasons. So yes, I’d rather have Marcel Shipp than Cedric Benson. Wow. Tampa Bay: 1; And its not Carnell Williams. I’m going to go with Earnest Graham, a guy who is just recently getting a chance. He runs hard and finishes his runs with a fervor I have never seen out of Benson. Carolina: None; DeShaun Foster and DeAngelo Williams are the two backs in Carolina, and while both might be better, I wouldn’t necessarily want both ahead of Benson. Foster can impress, but he is really injury-prone. New Orleans: 1; Reggie Bush isn’t an every down NFL runner, but I’d take him ahead of Benson. And this number would be 2 if Deuce McAlister hadn’t just blown out his knee. Atlanta: 1; Warrick Dunn has proven he can carry the load successfully. Jerious Norwood might pass Benson by the end of the season, as well. Indianapolis: 1; Joseph Addai is a monster. Tennessee: None; Although Vince Young might be a better running back than anyone on the Bears roster. Jacksonville: 2; Maurice Jones-Drew has not played well in 2007, but I saw enough out of him last year to know that he’s better than Benson. And yes, I’m going to say I’d rather go to bat with Fred Taylor. Taylor is about as injury-prone as it gets, but when healthy, he might be one of the ten most talented and hard-working backs in the NFL. Houston: None; No, Ahman Green is not better than Cedric Benson. Its close, though. Cincinnati: 1; Rudi Johnson, no question, and Kenny Watson–if ever given an opportunity–could prove to be an adequate dual threat out of the backfield. Cleveland: None; I am not a Jamal Lewis fan. Unless I can get the 2003 version. Baltimore: 1; Willis McGahee is not a picture of health, but he’s clearly a better player than Cedric. Pittsburgh: 1; Willie Parker, absolutely. And I’m tempted to add Najeh Davenport here, partly because he is a tough runner and partly because he once took a dump in a girl’s laundry basket. New England: 1; I love Laurence Maroney, although he seems pretty injury-prone. Sammy Morris may be a solid back, but I’m not ready to say he’s a better option than Benson. Miami: 1; Ronnie Brown’s resurgence this year has me flabbergasted. NY Jets: None; This is interesting. I have to divulge that I agreed with the decision the Bears made in trading Jones and allowing Benson to be the number one guy. Jones, while hard-working and a leader, isn’t fast and doesn’t break enough tackles to be considered a better option than Benson. Buffalo: 1; Marshawn Lynch has already proven to be what Benson should be, and he’s only been in the league for a month. Damn. San Diego: 2; I’m not even going to argue about one of these; and yes, I think Michael Turner, while having never had more than 25 carries in an NFL game, has shown enough that I would want him to be the Bears running back in the last twelve games of the season. Denver: 1; Travis Henry is better, although its hard to tell how good Bronco backs are because almost everyone can rush for 1200 yards there. Kansas City: 1; LJ is better, no question. Oakland: None; I’ll believe the Lamont Jordan renassiance when he carries the load for a full season with either sucking or blowing out a knee. Although I like the idea of Justin Fargas, Huggy Bear’s son, being an NFL star. So there you have it. A total of 28 running backs in the league are better options than Cedric Benson. Six teams have two backs on their current roster who I would rather see taking the bulk of Bear carries for the remainder of 2007. And only nine squads have the same issues at running back as Chicago does. Of those nine teams, only Detroit, Green Bay, and Tennessee have winning records. Detroit won’t have one by the end of the year; the Packers and Titans have superhuman quarterbacks to even things out. So there ya go. The answer is not actually Brian Griese, or someone else behind center; its the guy behind the guy.